In the thirty-first issue of the Bed and Breakfast Traveller, we take you to Penticton and Wine Country, where a fantastic vacation can be had all year round! Picturesque vineyards, gentle mountain slopes and dramatic clay cliffs surround one of the province's busiest resort communities. Okanagan Lake to the north. Skaha Lake to the south. 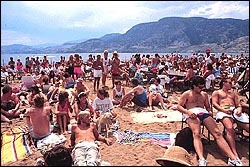 And more than 2,000 hours of sunshine a year make Penticton and Wine Country a spectacular vacation in any season. The city's many festivals and events make great centrepieces for family or business vacations. Indulge in your favourite outdoor activity, ride a trail, take a tour. Poke around in local shops, or just relax with friends. You might even want to check out the waterfront destination casino. More than 50 local wine makers welcome visitors to tour their pastoral vineyards and busy wineries. Sign up for a taste-tour and sample award-winning world-class vintages while enjoying the lakeside views. Visit the British Columbia Wine Information Centre for assistance in planning your wine tour. From wind-surfing and channel floating to downhill and Nordic skiing, Penticton and Wine Country has something for everyone. Sun-seekers enjoy some of the finest sandy beaches in the country. 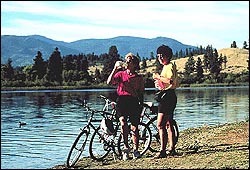 The Kettle Valley Railway Bed attracts hikers and mountain bikers to many scenic and challenging trails left open after the line was abandoned. Rock climbers test their skills on world-class Skaha Bluffs. And with one of the longest-playing golf seasons in the country (never mind a choice of more than 40 courses), golfers return to the city year after year. In winter, skiers and snowboarders attack the terrain at nearby Apex Mountain Resort. Penticton and Wine Country offer many places to visit. Amateur natural historians can tour desert research centres or agricultural sites. Museums and historical sites offer a glimpse into the regions boisterous past. The farmers' market is a great place to purchase in-season fruits, vegetables and the wares of local artists. Public and commercial art galleries display the works of painters, sculptors and photographers inspired by the scenic beauty and serenity of the area. The region is also an active site for the film industry, nurturing the dreams of students at the Okanagan School of the Arts. From beach-side resort condos and executive hotels to RV parks and family motels, wherever you choose to stay, you are close to quaint cafes, unique restaurants, lush green parks, sandy beaches and great shopping. Enjoy elegant waterfront dining or pick up a snack for the beach. Savour international cuisine, from Greek to Mexican, or drop by a coffee shop to calm your caffeine craving. Tempt your tummy with delicious sweets and gourmet sandwiches. With more than 100 eating establishments throughout the city, visitors have extensive dining choices including Okanagan fresh cuisine. A visit to Penticton would not be complete without a tour of the local shopping districts. Take the time to wander and appreciate the ambiance, the scenery, and the local architecture. With one of the longest playing seasons running from mid-March to November, this area attracts golf enthusiasts from around the world. The Okanagan Valley is British Columbia's premier golf destination for both golfers of all abilities. Whether you plan to visit in the spring while the orchards are in full bloom or arrive in the summer when the fruit is ready for picking, the Valley offers superb facilities and first-class tournaments to satisfy avid and casual golfers. The best vacations are an inspired mixture of relaxation and excitement. And once the summer reading is all caught up, you'll have no problem getting the adrenaline flowing at one of Penticton's many attractions. Spend the day at an amusement centre where you can opt for bumper boats, go-carts, laser tag, mini golf or the batting cages. Hit a bucket of balls at a local driving range to improve your golf game before tee time. Water beckons vacationers on many hot, sunny Okanagan days and Penticton has endless ways to beat the heat. Cool the kids off at a family water park. Float down the Penticton River Channel, slide into a refreshing pool at a waterslide park or rent one of the many watercrafts available on the lakeshore. For a change of pace, test Lady Luck at an exciting Caribbean-style casino situated on the shores of Okanagan Lake. 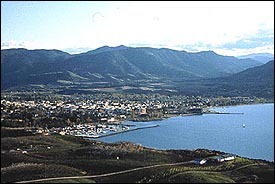 The area surrounding Penticton has long been known for its bountiful agricultural industry. The climate that makes vacationing a dream is what nurtures the area's farms, vineyards and orchards. Fruits, vegetables and quality wines are the rewards of cultivating this lush region. The wine makers at more than 50 local wineries invite you to sample their products and tour their charming facilities. Each is uniquely stationed with breathtaking views of lakes and valleys. Family tours through the surrounding vineyards are carefully planned to take advantage of the area's ideal climatic and soil conditions. Experience Penticton's wine country and discover why Okanagan wines have taken their place among the best in the world. Penticton is also proud to be the home of British Columbia's Wine Information Centre. The only one of its kind in Western Canada, the centre features over 400 varieties of VQA wines from around the province. As winter transforms the Okanagan's summer resorts into frosty play lands, this is definitely not the season to go dormant. Stroll along Okanagan Beach and marvel at the ice formations. Snowmobile through spectacular back country. Snowshoe over miles of sunlit snow. Check out a Penticton Panthers hockey game at the historic Memorial Arena. You'll fall in love with winter in Penticton. Apex is a full-service mountain resort that offers world-class skiing and boarding, breathtaking scenery and is renowned for its intimacy. Experience a truly magical winter with something for everyone including horse-drawn sleigh rides, snowmobile tours, ice-skating on the new skating loop or tubing in the lift-accessed park. This event is free for the kids and will work at the station with games etc. Admission Fee: Kids free --bring an old fashioned ornament to help decorate our Christmas Tree. This show is holiday fun for the whole family packed with local talent. Come and enjoy Christmas in the Country with carols, hot chocolate, apple cider, goodies and fun for the whole family. Children are invited to bring an old fashioned ornament to help decorate our tree.